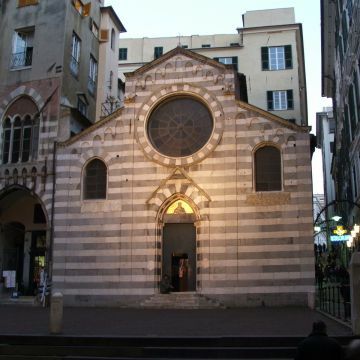 The church was founded in 1125 by Martino Doria and later rebuilt in a Gothic style. Visible under the right-hand window is the marble slab of the tomb of the famous admiral Lamba Doria. In the mid-16th century, Andrea Doria commissioned a new decorative design for the church's interior and had his tomb built in the crypt under the high altar. All the buildings in the square belonged to the Doria family; at no. 17 is Palazzo Andrea Doria, characterised by refined Gothic workmanship.